MEGADETH has recruited Dirk Verbeuren (pictured; SOILWORK) to play drums for the band while Chris Adler is busy touring with LAMB OF GOD. Verbeuren will make his live debut with MEGADETH later today (Friday, May 20) at the Rock On The Range festival in Columbus, Ohio. Adler played drums on MEGADETH's latest album, "Dystopia", and has taken part in most of the band's live shows in support of the CD so far. On those shows where Adler was unable to play with MEGADETH, he was temporarily replaced by Tony Laureano (ex-DIMMU BORGIR, NILE, ANGELCORPSE), the veteran extreme-metal skinsman who has worked as MEGADETH's drum tech since 2011. 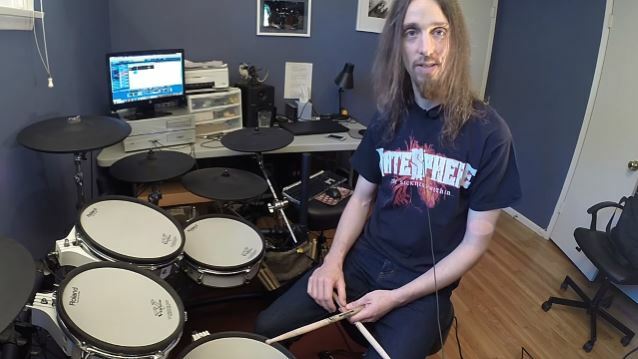 However, going forward, MEGADETH will utilize the services of Verbeuren, the 40-year-old Belgian-born-and-now-Los-Angeles-based drummer who has been playing with SOILWORK since 2005. Verbeuren was recommended for the MEGADETH job by Adler, who called Dirk "probably [one of the] top three drummers in the world." Chris told Banger TV's "Lock Horns" how the connection came about. "MEGADETH is on tour now doing a couple of festivals — same festivals that LAMB OF GOD is," he said. "We tried as much as we could with all the promoters and all the festivals to have us coincide and play on the same day. I've done double duty with LAMB and MEGADETH across the U.K. and just done five shows with them along this tour that we're currently on right now, because we were able to collide and make those things happen. As we go in different reactions and play different things, MEGADETH has a drummer to be able to play those shows. Dave [Mustaine, MEGADETH mainman] would certainly prefer to have me there, and I love playing with those guys and I would love to be there, but obviously I cannot be in two places at once." He continued: "Dave asked me… He said, 'As we're doing this, and if you're not able to be there… I understand you wanna fulfill your commitment with LAMB OF GOD. And we're planning on going over to Europe while LAMB OF GOD is still touring. Help me find… Who would you want to drum for us?' And I said, 'First of all, the drum tech you currently have, Tony, who was the drummer for DIMMU BORGIR and ANGELCORPSE, [he's an] amazing drummer, so you have someone on staff that can easily do this.' But then he asked, 'Well, if there was someone out there that you would personally recommend, personality-wise and playing-wise?' And [Dirk] just began the job today." MEGADETH filmed a video for the song "Post American World" late last month. The track is taken from "Dystopia", which came out in January. MEGADETH's current lineup is rounded out by longtime bassist David Ellefson and Brazilian guitarist Kiko Loureiro, best known for his work with ANGRA.